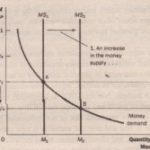 demand: Just as the supply’and demand for bananas determines the price of bananas, the supply and demand for money determines the value of Morley.Thus, our next step in developing the quantity theory of money is to consider the determinants of money supply and money demand. First consider money supply .In the preceding chapter, we discussed how the Federal Reserve, together with the banking system, determines the supply of money. When the Fed sells bonds in open-market operations, it receives dollars exchange and contracts the money supply. When the Fed buys government bonds, it pays out dollars and expands the money supply. In addition, if any of these dollars are deposited in banks which then hold them as reserves, the money multiplier swings into action, and these open market operations can have an even greater effect on the money supply. For our purposes in this, we ignore the complications introduced by the banking system and simply take the quantity of money supplied as a policy variable that the Fed controls. Now consider money demand. Most fundamentally, the demand for money reflects how much wealth people want to hold in liquid form. Many factors influence the quantity of money demanded. The amount of currency that people hold in their wallets, for instance, depends on how much they rely on credit cards and on whether an automatic teller machine is easy to find. And as we will emphasize, the quantity of money demanded depends on the interest rate that a person could earn by using the money to buy an interest-bearing bond rather than leaving it in a wallet or low-interest checking account. Although many variables affect the demand for money. one variable stands out in importance: the average level of prices in the economy. People hold money because it is the medium of exchange. 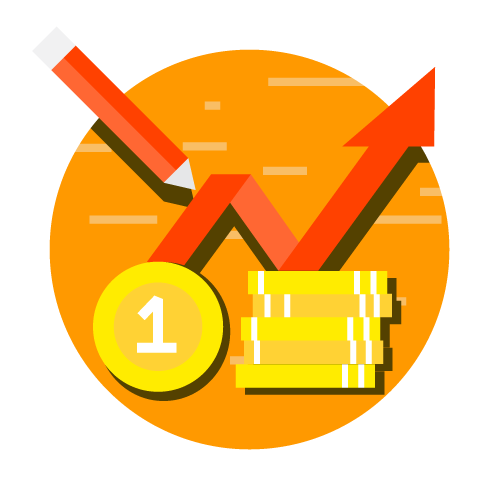 Unlike other assets, such as bonds or stocks, people can use money to buy the goods and services on their shopping lists. How much money they choose to hold for this purpose depends on the prices of those goods and services. The higher prices are, the more money the typical transaction require s, and the more money people will choose to hold in their wallets and checking accounts. That is, a higher price level (a lower value of money) increases the quantity of money demanded. What ensures that the quantity of money the Fed supplies balances the quantity of money people demand? The answer, it turns out, depends on the time horizon being considered. Later in this book, we will examine the short-run answer, and we will see that interest rates play’ a key role: In the long run,however, the answer ‘is different and much simpler. In the long run, the overall level of p rices adjusts to the level at which the demand for money equals the supply. If the price level is above the equilibrium level, people will want to hold more money than the Fed has created, so the price level must fall to balance supply and demand. If price level is below the equilibrium level. people will want to hold less money than the Fed has created, and the price’ lever must rise to balance supply and demand. At the equilibrium price level, the quantity of money that ‘people want to hold exactly balances the quantity of money supplied by the Fed. The two curves in this figure are the supply and demand curves for money. 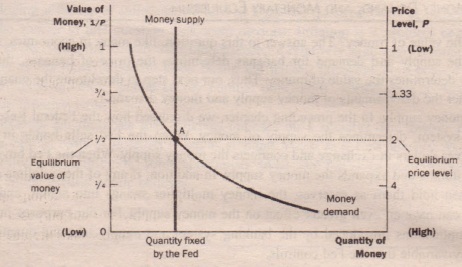 The supply curve is vertical because the Fed has fixed the quantity of money available. The demand curve for money is downward sloping, indicating that when the value of money is low (and the price level is high), people demand a larger quantity of it to buy goods and services. At the equilibrium, shown in the figure as point A, the quantity of money demanded balances the quantity of money supplied. This equilibrium of money supply and money demand determines the value of money and the price level.